Open access (OA) means that materials are made freely available to the general public. The open access movement pushes back against the traditional model of publishing whereby authors sign their scholarly work over to publishers, who in turn charge academic institutions and the general public large sums of money for access to this information. In general, the open access movement supports the idea that research--particularly research funded by the public--should be available to the public at no charge. What Does Open Access Look Like? Works are generally made open access by following one of two paths, which have been labeled "gold open access" and "green open access." Hybrid OA is a third "in between" option. Gold OA material is published in open access journals which make their content freely available to readers. Open access journals may or may not charge authors processing fees to fund the journal. Green OA consists of work previously published in traditional journals but subsequently archived online, on a personal website, a social media site, or in a subject-specific or institutional repository. Hybrid OA comprises journals that charge subscription fees but make certain articles available open access. Often the author is required to pay article processing charges (APCs) in order to make her work open access in these journals. Hybrid publishing (and supporting funders) has attracted criticism of late for increasing the primacy of publishers with already monopolistic tendencies. See Peter Suber's Open Access Overview page for more information about these models of open access. Washington State University is committed to sharing its knowledge with the local and global community. Because of its land-grant heritage, the university is uniquely positioned to help resolve problems related to health, water, food, energy, education, and quality of life. Overall, the open access philosophy fits neatly both with the goals espoused by the university's primary funders and the recommendations issued as part of the Drive to 25. Open access allows researchers to increase the visibility of their scholarship in a digital world. 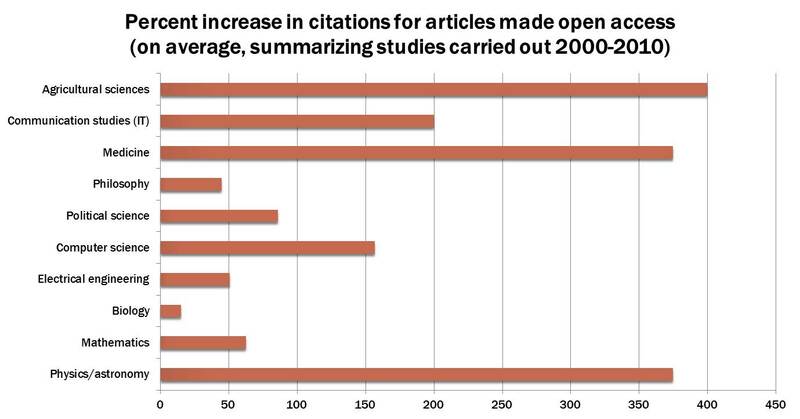 Studies suggest that research made available open access receives more citations than work published solely through traditional methods. Open access publishing allows researchers to share their expertise with a global audience. "OA2020 is a global alliance committed to accelerating the transition to open access." This document, published in the MIT Press Essential Knowledge Series, defines and explains open access. Authored by Peter Suber. "OpenCon’s programs work to develop, activate, and connect a global community of next generation leaders who are driving the culture shift toward open locally, nationally, and internationally."